The .50 Action Express was introduced in 1988. The cartridge was designed by Evan Whildin, former vice-president of Action Arms. Whildin designed the cartridge as part of a program to boost the performance of the semi-auto pistol by creating a new cartridge design. Whildin developed the Action Express line to travel faster and fire hotter than standard forms of ammo. When testing was complete, Whildin released the line to the public. It included the .50 AE, a 9 mm and .41 caliber rounds. Although the smaller calibers never gained popularity, the .50 Action Express caught the attention of the firearms community. The ammunition is still available from several major manufacturers including CCI, Speer, Hornady, and IMI (imported by Magnum Research). 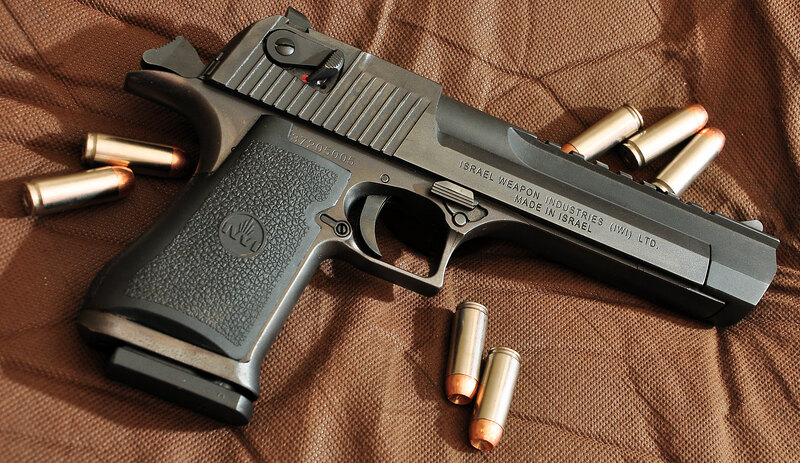 The .50 AE was destined to be used in the IMI Desert Eagle, a semi-automatic pistol imported by Magnum Research, Inc. The gun was already chambered for the .44 Magnum, and would only need a barrel change to use the .50 cal. The .50 AE features the same rim diameter and overall length as the .44 Magnum. The .50 Action Express ammo is one of the most powerful pistol cartridges on the market. It has a .500-inch bullet diameter enclosed in a 1.285-inch straight-walled case with a rebated rim. SAAMI says the maximum pressure of .50 AE should not exceed 36,000 PSI. Users report a significant recoil and muzzle blast. Many compare the recoil to the .44 Magnum. The .50 AE uses a 325- grain bullet and offers a muzzle velocity of 1400 FPS. The 300-grain bullet has a muzzle velocity of 1400 FPS and offers 1414 ft-lbs of energy. The .50 AE cartridge is available in several bullet types, including jacketed hollow point (JHP), Bonded Jacketed Hollow Point (BJHP), soft point (SP) and Jacketed Soft Point (JSP). JHP ammunition uses a lead bullet encased in a hard metal, typically copper. The bullet contains a hollow point, which allows the bullet to expand upon impact. Users choose JHP ammunition for personal protection, home defense, and game hunting. Soft Points do the job although they offer less stopping power. It gives shooters a slower expansion and deeper penetration. Manufacturers use a soft lead projectile. As a result, hunters will use soft point bullets in areas where JHP cartridges are restricted. Whildin had a contract with the Israeli military. The Israeli Military Industries (IMI) Magnum Research Desert Eagle uses the ammunition, however, it was not the first gun to use the round. The first firearm chambered in the .50 AE caliber was the Arcadia Machine and Tool Automag V, a semi-auto, single action pistol. The weapons is described as the most “ergonomic and lightweight” of big caliber handguns. Shooters choose the .50 AE when they want maximum power. Users prefer the round for silhouette shooting and medium to large game hunting, suitable against large predators such as bears. The Bureau of Alcohol, Tobacco, Firearms and Explosives (BATFE) categorizes the non-sporting round as a destructive device under its current regulations.